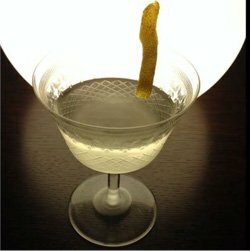 An ‘improved’ martini. A touch of sweetness to round out the flavours. Bitters to add a kick of hop bitterness and rev up the citrus aromas of the gin. And a spot of absinthe is always an improver. Spray glass (or rinse) with absinthe. Stir remaining ingredients and strain. Express grapefruit zest over.